Produced by Jose Ferro. Mixed by Mudrock. Who says time travel isn’t possible? Here I am spinning Long Live Me, the debut by Los Angeles’ The Screamin’ Lords, and I could swear I have been transported back to 1991/92. I guess it shouldn’t have been surprising, because once I looked at the liner notes I noticed that several grizzled hard rock veterans made an appearance here, among them Baton Rouge‘s Kelly Keeling, MSG‘s Robin McAuley, Dokken‘s George Lynch, Megadeth‘s Chris Poland and Little Caesar‘s Loren Molinare. Sometimes when you put together a star-studded collection of musicians they feel the need to experiment and venture from the sound that made them popular. But not here, the four members of The Screamin’ Lords have made sure everyone embraced their pasts and it resulted in a great album. An album that sounds old, yet fresh at the same time because few bands are playing melodic rock like this anymore. When I first played Long Live Me, I wondered if I had mistakengly slide a Hardline disc into the CD player. The Screamin’ Lords have much in common with bands such as Hardline and Baton Rouge, bands that played hard rock with some class. Of course this new group also mixes some ‘balls to the wall’ rock with that class, resulting in an album that straddles the border between melodic rock and full-blown sleaze. My favorites are “Long Live Me”, a song that just flies by with its rapid beat, “Halo”, “Fire In The Blue Sky” and the Fastway sounding “Gladrags & Limozenes”. Speaking of Fastway, the band also covers their signature song “Say What You Will”, and manages to capture the crisp guitar tone that made the original a classic. If you want to relive the glory years when rock music was at its commercial peak then look no further than Long Live Me. They may be new to the scene, but The Screamin’ Lords have nailed down a sound that made countless groups superstars in the early 90s. 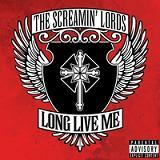 ‘Long live’ The Screamin’ Lords, because I can’t wait for their next release! Reviewed by Skid for Sleaze Roxx, December 2007.